Behind the Bit: Rust breeches: The comeback color? Rust breeches: The comeback color? Update your BTB link! Due to a failure in my blog service redirect some links are broken. Update your link to http://behindthebitblog.com (behindthebit.blogspot.com may not work any more). Back in 1978, rust breeches were a new fashion trend on the hunter/jumper show scene, and a navy coat and rust breeches were what the kids were wearing. Stacia Madden (back then Stacia Klein) and I competed in the same region/circuit, and I can attest that she wore them. That's me in the photo below, stylin' in my cordovan boots and rust Harry Halls. No navy coat for me, but a muddy tweed. Since I'm name dropping I'll mention that this used show coat was previously owned by then up-and-coming teen rider Donald Cheska. Well. What an... honor? I couldn't find a used ladies coat to fit my tall frame/long arms, and even this man's coat didn't fit well (look at the sleeves)! You take what you can get. Now here's a stunner. According to the Horseman's Outlet sales lady, rust is making a comeback. Rust! There is a COTH post about the various shades of rust to back this up. What do I think? The earth-tone rust of the seventies has a place in the equestrian world, but it seems that the "new" rust ranges from the brick color of my youth to well, orange. The Horseman's Outlet's selection ranged from burnt orange to a bright pumpkin. Ick. I can't close this post without mentioning the horse I was riding in the photo above. Foxfire was a girl scout summer camp horse that became a school horse at our farm in the fall and winter. I leased him 9 months out of the year for $50/month. An honest, big-strided, tidy jumper, Fox's breeding was a mystery, but he almost certainly had some TB in him. We foxhunted, and we competed in children's (3') and junior (3'6") hunter. What a joy he was -- uncomplicated and dead honest, he was the kind of horse that made you believe you were a better rider than you were. We showed infrequently, but managed to get good ribbons and even championships when we did. My Mom showed with Donald Cheska too, her maiden name is Liza Scott, I wonder if you two know each other? I recognize those pictures! I miss Foxfire and Rufus and the fun we had hanging out at the barn in our rust breeches and striped shirts. Janice -- I don't know if the kids today have as much fun -- their parents are too INVOLVED! Remember when we showed up at the barn in subzero weather? Water froze on our jackets in seconds, so at least we didn't get wet. I remember you won a year end award on Rufus -- he was a doll too. Remember when water buckets iced up and we earned lessons by changing all of them for the entire barn? What a lot of work we did just for the privilege of being at the barn, but we were pretty much free to do what we wanted there. I still have my program from the IHJA for that year when Rufus placed fourth in Children's Hunter. Everyone was so surprised that this mostly Standardbred camp-horse gelding did so well but he was pretty awesome (as was Foxfire). Wow, hard to believe that we may be seeing rust back on the show circuit. Atleast George Morris wil be in style since that's about the only color he wears. Nice horse by the way, you guys looked really nice. Ah, yes, I remember the rust breeches. Practical, acutually--unlike the white I wear for dressage!! At one point, I had a green jacket to go with them. Somewhere along the way I moved into navy blue. I had the cordovan field boots too! A real fashion plate. I used to show in all kinds of weather. I still remember one or two shows where, at the end of the day, I poured water out of my riding boots. 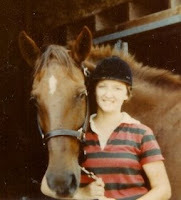 I loved the rust breeches...they matched my chestnut mare. 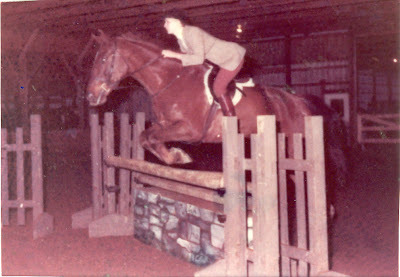 I wore mine primarily for schooling shows, often with a forest green sweatshirt. I didn't like rust breeches then, and I don't like them now - but luckily I don't show any more, so it doesn't matter! And wouldn't you know it -- I just got rid of my rust breeches from the '70s. Not that they fit. I had two pairs of those rust breeches that would NOT wear out, not matter what I did in them. How can brand-new state of the art breeches start losing their waistbands after a year, and my old rusties from the 70's still hold on? Is it the horrible fabric? I finally tossed them 5 years ago, with every stitch still intact. They looked a month old. Except for the (cough cough) color!